On a hot sunny afternoon the Butlers Court End of Season Netball Tournament took place on Tuesday 23rd May 2017. 21 children from years 5 and 6 were split into 4 teams. Teams played each other once in games of 6 minutes each way rotating positions at half time and at the start of each game, as per High 5 rules. All games were closely contested with only 3 points separating 1st and 2nd places. 3rd and 4th places were also separated by the same margin. Thank you to Mr Reynolds and Sophie Habgood for assisting with the scoring. Mrs Marshall presented certificates to all 21 participants with winners medals awarded to the winning team. It was impressive to see how the children supported each other in their teams with the more experienced netballers giving advice and encouragement. A huge thank you to Mrs Cook and Sienna Gianneri, from Beaconsfield High School, for their help this year and to all the parents/carers for their support during the season, particularly those who have helped with transport for away games and tournaments. However, the biggest thank you must go to the children who have attended netball club, whatever the weather, throughout the year. It has been a pleasure to see their skills develop and share in their enjoyment of a fantastic sport. 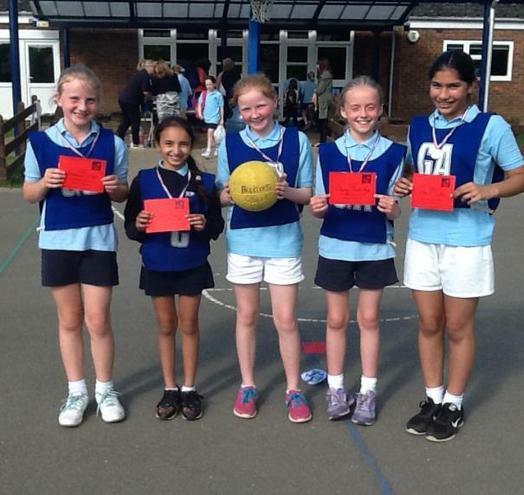 I wish all the year 6 girls good luck in year 7 and look forward to hearing of their netball involvement in years to come. Netball will start again in September and I hope to see the return of existing netballers and any boys or girls who would like to join Netball Club will be more than welcome.